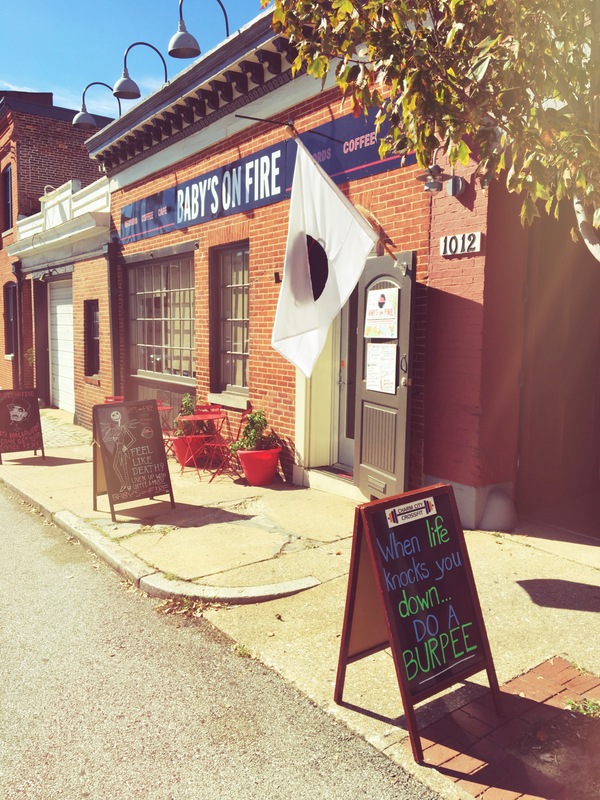 Baby’s on Fire – eating my way through Charm City! 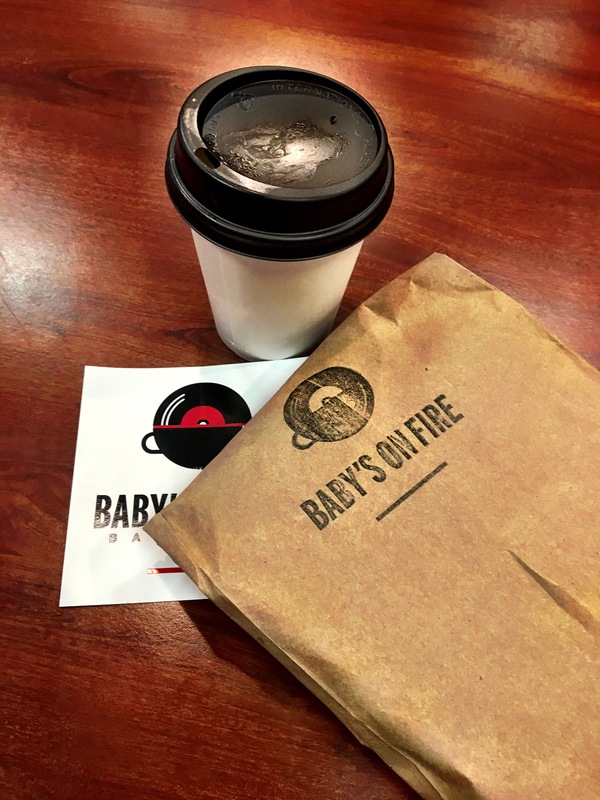 Mount Vernon is loaded with coffee shops, yet Baby’s on Fire finds a way to create an its own niche. From the moment you walk in there is a welcoming vibe. It is tucked off the main drag – on Morton St. just south of Chase St. I would expect it to be empty, but it has been filled every time I’ve walked in. With a bunch of four-tops, folks tend to share their tables and their conversation with strangers. A refreshing feeling in a city that can feel somewhat divided as of late. The spot is owned by two music loving locals and designed to be a place where you can fill your caffeine fix and browse the vinyl music selection while waiting for your coffee. I peered through the bins, taking a look at the selection – a mix of common artists and some I have never heard of. They are often tempting you with some of their choices by playing a musical selection throughout the cafe. There is really something different about the way the music sounds from a record on great speakers. Here is the spot to check it out if you have forgotten or are too young to remember record ever existed. I am a fan of Stumptown Coffee, our of Portland, Or. Ok, if you read this blog, you know I am a fan of most coffees. On this particular day I tried the Crimson and Clove’r. The barista’s are quick and talented. I had mine to go, so I lacking a photo of the latte art. I forget that lattes have too much milk for me, but I loved the flavor of this drink – plus, it reminded me a little of Joan Jett’s version when she was here for Artscape a few years back. This was a little bit spicy and a little bit sweet. Clever drink names – perfectly paired with the theme of the coffeehouse. Chef and Owner – Shirlé Hale-Koslowski – are bringing tasty morsels, that you can grab on the go. I went for the Albini Panini – a country white bread sandwhich that is stuffed with salty Proscuitto, a slather of rich pesto, fresh, creamy mozzarella and kale – all that yummy goodness is pressed together to add some crunch and some appetizing grill marks. There are food choices for all types of diets though: vegetarian and vegan panini’s, fun pastries, and bagels with toppings. I really need to do more manicures if i am going to take pics of food in the air. I recommend these guys for the coffee lover, music lover and of course if you need a quick bite. The food isn’t super heavy – but perfect for a lunch on the go. (The above sandwich comes with chips). Plus, they gave me swag! Have you been here, yet? What’s been your favorite? This entry was posted in Charm City, Coffee, Lunch, Mount Vernon, Yay! I'm a Fan!. Bookmark the permalink.